300 years later Gondar still center of Ethiopianism! In the early 1700s, over 300 years ago, the history of Ethiopia changed forever. The Ethiopian kingdom (which then used the label Abyssinia interchangeably) was ruled by the Yejju Oromo people. It was a unique period in Ethiopian history because, for the first time, the rulers did not use the language of the Orthodox Church scriptures. The Yejju Oromo dynasty (mainly led by Ras Ali and Ras Gugsa of Yejju) was headquartered in Gondar city and they changed the language of the Gondar court to Afan Oromo, effectively making it the official language of Abyssinia. This period is not often stressed in our history books but it was a vital turning point in Ethiopia, which showed that the state was becoming more multiethnic and diverse, even while Orthodox remained dominant. It was the birth of a larger, inclusive and more powerful Ethiopian state, the basis of modern Ethiopianism. Over 300 years later, the city of Gondar is becoming the battleground for the rebirth of Ethiopianism. Last week, hundreds of thousands of Ethiopians in Gondar staged a massive demonstration, in a courageous defiance of the TPLF regime’s ban on protests. History teaches us that whenever the TPLF regime prohibits a public demo, it will shoot to kill if anyone dares to protest. But the brave people of Gondar were not scared! They have had enough of the TPLF dictatorship. What surprised many observers was that, while protesting against the TPLF annexation of Welkait, the people did not wave the so-called “Amhara region flag.” The protestors were not much interested in the sovereignty or supremacy of Amhara. 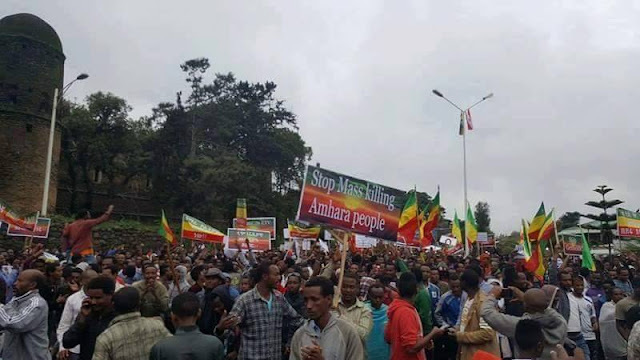 Not a single “Amhara flag” was seen! But almost everybody was waving the patriotic Ethiopian flag. It was a symbolic move to teach TPLF two lessons. 1) The first lesson was that as “designated Amharas,” the people of Gondar rejected welkait’s annexation to Tigray, to show that the fake borders are illegitimate. The people proved that they can beat TPLF in its own game. 2) and secondly, as Ethiopians, they proved that unity always BEATS division and the ethnic-federalism apartheid system will never destroy Ethiopian nationalism! By rejecting the Amhara flag, the Gondar protesters proved they reject tribalism….and by rejecting the Woyane 5star flag, the protestors showed that Ethiopia is not a fragmented nation of many tribes. It is a united one nation period. Just like 300 years ago under Yejju Oromo rule, it doesn’t matter whether we speak Amharic, Oromiffa or Tigrigna, because we embrace all Ethiopian languages. We embrace all religions and many cultures. But We are still one nation under God! One thing is for sure. The Welkait issue is not the first boundary dispute or the last. Everywhere in Ethiopia, we have tribal border clashes thanks to TPLF’s disastrous ethnic-federalism system. Meles Zenawi has institutionalized tribalism and we are suffering the consequences. In some parts of the south, it is even worse. The recent Konso uprising is another example. Tiny tribes and clans everywhere are demanding their own independent country, but they don’t even own a district; most tribes don’t even know where their borderline begins or ends. Things will get more out of control unless TPLF’s ethnic federalism fiasco is replaced with REAL federalism that empowers people at the local level without dividing them. We can not have a country where the government exploits our differences. Ghana has a tougher and more complex ethnic diversity but Ghana managed to democratize without promoting tribalism. We can do it too. We are already witnessing the fruits of the Gondar protests. Over the weekend, protests in Adama were started by Oromo activists but thousands of Adama protestors were shouting unity slogans saying, “we are Amhara and we are Oromo!” What a huge victory for Ethiopia and Ethiopiawinet! Then in Bahir Dar, tens of thousands of protestors sent TPLF a loud and clear message, “Ethiopiawinet is not terrorism, Ethiopiawinet is not terrorism,” they shouted. Many misinformed outsiders may wonder why Bahir Dar people rejected Amharanet in favor of Ethiopiawinet. In reality, even after TPLF tried to brainwash the new generation to accept an ethnic label, it has not really worked everywhere. TPLF propaganda has failed. Many scholars like Prof. Mesfin WoldeMariam have pointed out the obvious about the Ethiopian melting pot for many years; describing how Amharic speakers represent not just so-called “Amharas” but all Ethiopians from all tribal backgrounds. We do not need to be a rocket-scientist to understand that after 300 years of so many ethnic groups blending together, we should not be surprised if protestors in Bahir Dar or Adama or Addis Ababa say “we are Amhara and Oromo” at the same time! We are simply Ethiopians. Even after 25 years of assault, Ethiopianism and Ethiopiawinet is alive and kicking. Ethiopianism is irreversible and unstoppable because TPLF might impose labels and FORCE our people to choose one ethnicity for our Identification Card (ID) but millions of us are a byproduct of the multiethnic fusion of the last millennia. The TPLF census says Oromos and Amharas are the two biggest groups in the country. That is false. In reality, those of us who call ourselves Ethiopians and only ETHIOPIAN is the biggest group in the country! Ethiopiawinet has survived its biggest challenge in 300 years, and sooner or later, it will be victorious once again.